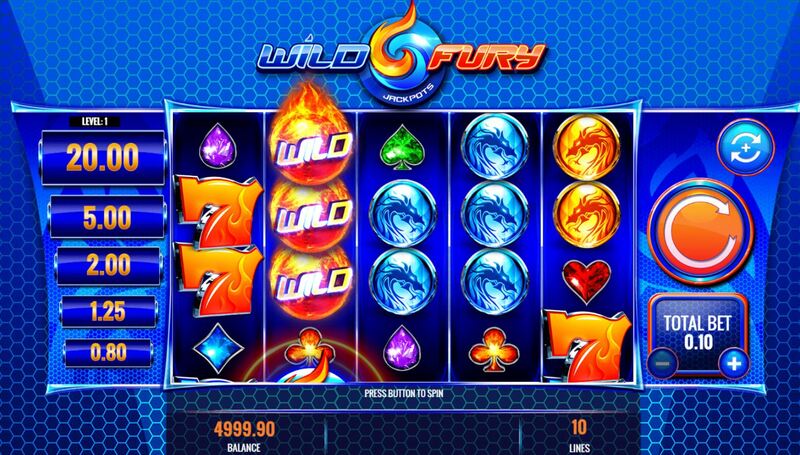 Wild Fury slot is nicely retro in appearance and very blue, with dark blue reels over a lighter blue mesh background and some boppy synth music originating from the birth of home computers back in the 1980's. 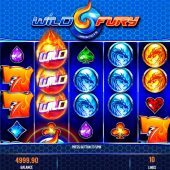 There seems to be a craze for retro slots recently with those basic symbols and a notable example is Red Tiger's Laser Fruit but Wild Fury seems most similar to the older Bally Quick Hit games, like QH Platinum. The title suggests Wilds are important but will we be in a fury too after risking our bankroll here? This is the first slot I've seen which has a large grid of 5 reels and 4 rows (normally indicative of 40+ pay lines) yet has only 10 pay lines! Icons are single except for stacks of the red and blue 7's and full reel stacked Wilds in the form of balls of fire. As we only have 10 lines the pays are quite high for some symbols with the Wilds best at 50x bet, then either blue or red 7's at 10x, blue or yellow Dragon 6x with six different gemstones all paying 3x bet for a full line of 5. There aren't any random events here but there is an interesting free spins set-up. The game logo can appear singly on the centre 3 reel and it's these 3 you need to earn yourself a bonus wheel which will award either 10, 15 or 20 free spins during which there is a green '+1' symbol to award extra spins. In true IGT fashion nothing is that simple though as there are internal 'jackpots' on offer of which you are guaranteed to hit one. Don't get too excited though as these are decided by Wilds accumulated in the bonus. If you accrue less than 20 it will start at 8x bet, 20-39 12.5x, 40-64 20x, 65-99 50x and finally if you get 100+ Wilds it will begin at 200x stake. This may sound pretty low but on reel 3 there is a 'level-up' or 'double level-up' tile which will thus double or triple your final jackpot amount. You can raise it up to 10x so the best possible would be 2000x bet. Quite an interesting bonus and your meter is shown on the left of the reels.